Terrence Murphy’s Forty Steps and Other Stories is a well-crafted, intriguing volume of 16 tales set in the small, fictional town north of Boston called Egg Rock. Entwined with history, legend, and the beauty of place, stories of this unique island community play out over centuries to link characters and events of both past and future. These stories offer a mix of colorful, solemn, and tenacious New England characters who attempt to conquer or circumvent life’s harsh realities. The collective atmosphere is laced with accidents, illness, wartime trauma, and criminal behavior. From “Thornvald Pays His Respects,” the opening first-person narrative that draws us to the memories of an ancient Viking describing the early exploration of this magical “almost island,” to the final “Seismic Events” entry that takes readers into a scarred, futuristic 22nd century vision, Murphy’s well-conceived work covers an expansive timeframe. While each story could stand alone, together they become connected by chronological happenings and re-appearing characters. 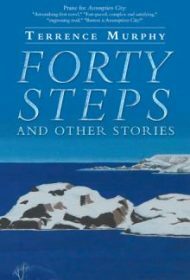 The titular work “Forty Steps” creatively transfers the astute observation of a mental patient during his prescribed walk in the salt air to subsequent events in the story “Bottoms Up,” where a revered astronomer is found culpable of a heinous crime perpetrated in his youth. In “The Curlew Beach Incident,” a writer finds solace in a seaside cottage, but her happenstance rescue of a WWII enemy spy later leads to unexpected consequences. Murphy’s artful prose captures the intense, elemental beauty of this island whose prominence seems a character unto itself, noting at one point: “The sky turned an unnatural deep blue by day as if a landscape painter had chosen the wrong color.” The stories shine with revelatory tidbits that bring surprising twists to the characters and their actions. This is a smart, richly textured collection featuring fluid narratives, varietal characters and fine detail. Although one free-spirited resident may bemoan being “trapped on this island,” readers will find a literary visit to Egg Rock truly memorable.